Actress/writer/model/vocalist/DIY filmmaker Lary Love Dolley, a.k.a. 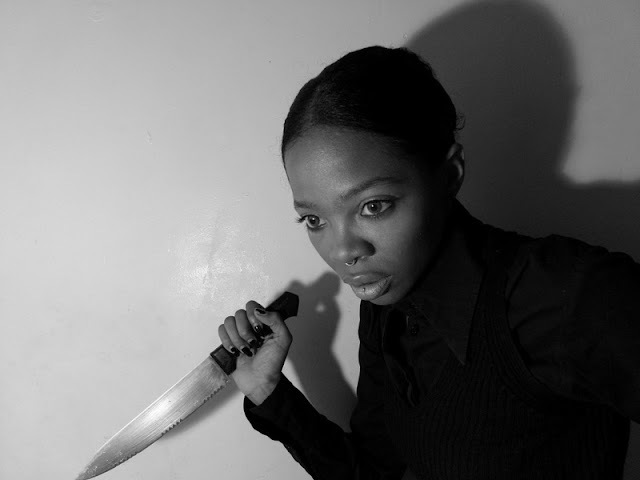 "The Evil I" caught my eye when we connected on Twitter via her micro-blog, Blood of Ganja where she highlights Black women in horror in similar fashion to our Tumblr site. Exciting things are happening for Dolley as one of hardest working emerging scream queens/screenwriters in the horror industry. Dolley has made appearances in many mediums from Grindcore & Punk bands, independent films, magazines to TV notably HBO's Treme. Additionally, she had a part in The Butcher, a short horror film by Filmbalaya Films and her latest self produced film Ectoplasm has recently been submitted to the Grolsch Film Works Short Festival. The way Lary puts it, "...people need to seriously recognize that black women are not a monolithic group regardless of what the media constantly attempts to perpetuate. That is why we have to tell our own stories." So you were raised on John Waters movies and Purple Rain. Name some of the first horror films you remember watching and how much did they influence your interest in the genre? Angel Heart, Dolls, Vamp, Prom Night, The Texas Chainsaw Massacre, Return of the Living Dead, Night of the Creeps, Nightmare on Elm Street 4. I can certainly say these piqued my interest in horror to some degree. There has been this draw towards morbid and lurid matters since childhood. Who has inspired your stylistic approach to making horror films? Maya Deren and Kenneth Anger amongst others. My interests in foreign horror, the occult, art, music, obscure and macabre matters also inspire me. These sources are constantly in flux. Stereotyping and gender issues are still all too pervasive unfortunately. Where traditional resources are lacking, the internet gives me a platform that allows for control over my image and creative output. More acting, collaborating with others and creating my own interpretation of horror. 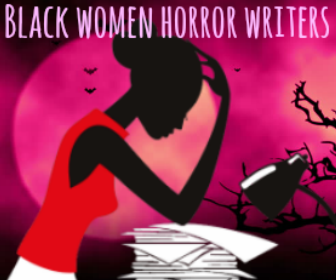 I would like to see not only more visibility but also Black women genuinely recognized within the horror genre. You mention wanting to start a horror film production company. What do you envision for this company and how will it stand out from the others? My unique outlook will set it apart as well as a diverse crew and talent pool. I have no intentions of playing it "safe", horror is supposed to be uncomfortable. I look forward to giving people nightmares and unsettling thoughts for a long time.